Of course, humans excel at “social tool use” as this behavior is known. Our large brains and unique cognitive capacities, say geneticists Sergey Gavrilets and Aaron Vose, “evolved via intense social competition in which social competitors developed increasingly sophisticated ‘Machiavellian’ strategies as a means to achieve higher social and reproductive success.” It’s our conniving, manipulative brains, according to this theory, that contributes to human nature and partly explains our evolutionary success. For the experiment, Schweinfurth and her colleagues presented a group of chimpanzees with a rather challenging apparatus consisting of a fruit juice fountain and a pair of buttons that released the juice. Frustratingly for the chimps, however, the fountain and the buttons were located nine feet (3 meters) apart, which meant a single individual couldn’t both press the buttons and satisfy their thirst at the same time. So, to get at the desired fruit juice, another individual was required. It proved to be a frustrating predicament—except for a 24-year-old adult male chimpanzee named Bobby. This resourceful chimp quickly grasped the concept of social tool use, employing other members of his group—namely three younger members of the troop—to push the buttons while he reaped the rewards at the fountain. But this was no quid pro quo arrangement; Bobby did not return the favor. Bobby displayed several behaviors aimed at enticing the juveniles to press a pair of buttons that activated a juice fountain located 3 m away from them. His behavior varied in the level of control over the juveniles. First, he actively recruited them by rolling or dragging them toward the buttons. In those situations, the juveniles seldom had the chance to escape and were under Bobby’s almost full control and in constant contact. Next, Bobby pushed the juveniles in the direction of the buttons. Because the buttons and the fountain were 3 meters apart, he had to release them to drink from the fountain. Hence, his control was limited, and the juveniles could decide whether to press the buttons or to escape. In the case of escaping, however, the social tool user successfully retrieved them in almost half of the cases, suggesting some form of control. When these strategies failed, Bobby resorted to stereotypical chimpanzee begging behavior, which included the blowing of raspberries with his mouth and reaching out with his arms. Incredibly, this lone adult male used other chimpanzees more than 100 hundred times to gain access to the juice. The researchers say it’s now the “biggest data set” of social tool use recorded among nonhuman animals. Bobby’s repeated use of other individuals as social tools is a complex behavior, and potentially indicative of Machiavellian intelligence. In terms of limitations, it’s important to point out that only one individual, Bobby, was observed to exhibit this behavior. It’s possible that Bobby is an outlier in terms of his intelligence, or he had some previous experience with humans that somehow influenced his behavior. Future observations of social tool use in other apes in different contexts would be good to corroborate these findings. Still, it’s surprising that Bobby used a strategy that, for him, was spectacularly successful. 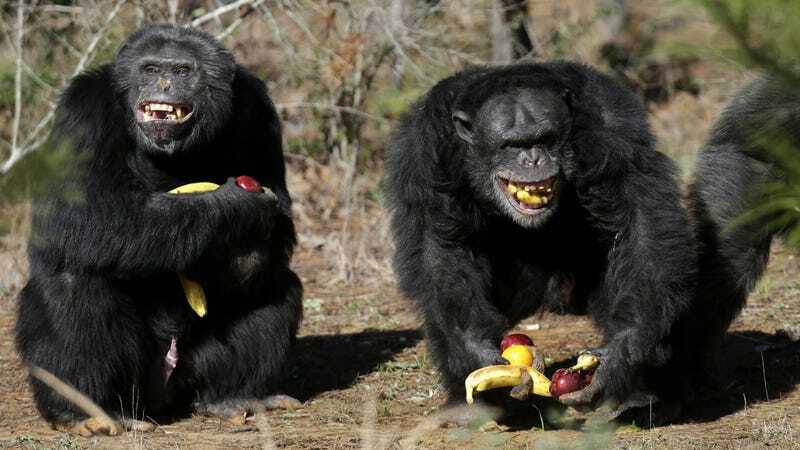 So yes, some chimpanzees, like some humans, are just manipulative assholes.